First build video from Edgewater. Monster build. New, waterproof, thicker foamboard. Monokoting. Game changer, and just as fun as always. Thanks guys. Yes I was pretty impressed with this one. This sort of build could make a practical UAV platform too, and I hope the thick foam makes it to Canada (seeing how the waterproof brown foam is yet to do so). Having it white instead of brown is really nice and makes for easy, attractive color schemes without painting the whole thing. It also looks like that thick foam comes in larger sheets as there were some pretty big single sections. Hey Adams, can we get that stuff shipped out to Dollar Tree too? The truck hit pretty hard but those things have good suspension. Pretty cool. NO! I completely missed it! Going to have to re-watch and see what they've got up their sleeves. Their usual MO is for the producer to make sure that interesting (and often upcoming) builds are in the background when they do their vids. I've got to go back and look for that! How cool would that be?! There's also a crazy bat thing in this video. 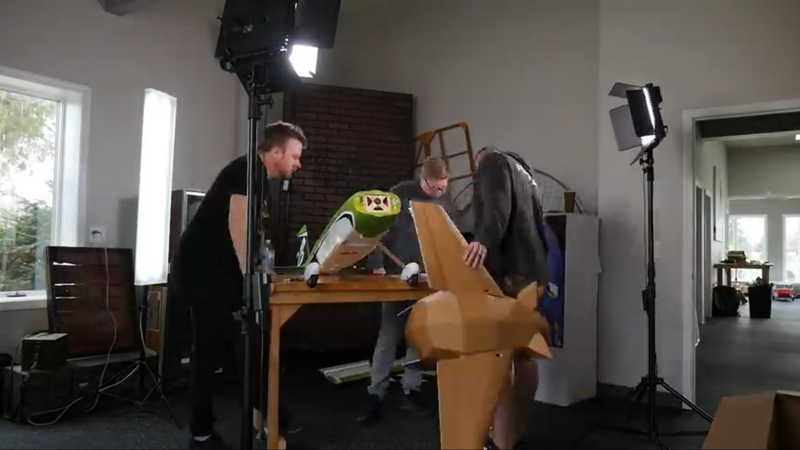 The Pig has WINGS! Or is it a warthog?! Holy cow, what do you do, analyze these videos? Yep I saw it. Barely. Once you mentioned it. It's all rounded. Master Series is my thought. And it was... Beautiful. They are killing me... I mean it's not like I don't already have a HUGE backlog on my build list... now this! (Oh, right, I've got the pop-up camper...) Darn. You think it's a pig... Might be... I guess we will have to wait and see. If shipping is as "cheap" as the shipping for the current foam board it's not gonna change much. Unless you live right next door it's gonna cost an arm and a leg to get the thicker foam. I'm a confessed Fanboy. Let's get that out of the way. What you're talking about is shipping a box that is Thirty inches by Twenty inches by Twelve inches. There is no doubt in my mind that if you find a cheaper way to ship it and show them? They will adopt it on the spot. Unfortunately, it costs a bundle to ship. I won't be getting any, anytime soon. Thankfully I've got a DollarTree 20 minutes away and I can still keep flying and crashing and rebuilding! Edit: I made corrections because I had the approximate size wrong. Thanks, @buzzbomb. That is a great episode and a fantastic way to kick off build/crash/fly/repeat at the new diggs. Well, those of us who can only buy at Dollar Tree can hope that the foam ended up twice as thick as the standard foam. Then the plans could readily transfer to laminating a pair of boards together. Fingers crossed? That is a weird bat like plane!!! Looks like an FT Spear with a funky bat body. I was looking at it backwards. You're right. Those big ears at the front must catch a lot of air, though! This was the best episode they've done in a while, nice to see them hit their stride again. It's an actual pig, guys. Wow............ I can sense a Pink Floyd theme coming up before too long. Will they paint it pink or will it be black with with a crossed hammers logo on its side?